When placing an order, you will be asked how to pay for the product. Use the drop-down menu and choose Ewallet or Credit Card to settle the payment. 2. Transfer your EWallet earnings to another member or IBO. Login to your Virtual Office and go to your EWallet menu, select ‘EWallet Transfer’ then enter the IBO ID# you want to transfer to the amount and fill in your eWallet password and click ‘Submit’. 3. Withdraw EWallet through Direct Deposit or LGPN Pay Card (USA) or Payoneer (Other Countries). 1. Please fill out a Direct Deposit form or request for an LPGN Pay Card prior to going through the withdrawal process. Both forms are available to download in the resources page or the bottom of the eWallet Withdrawal screen. 3. Get your money through Direct Deposit or LGPN Pay Card. 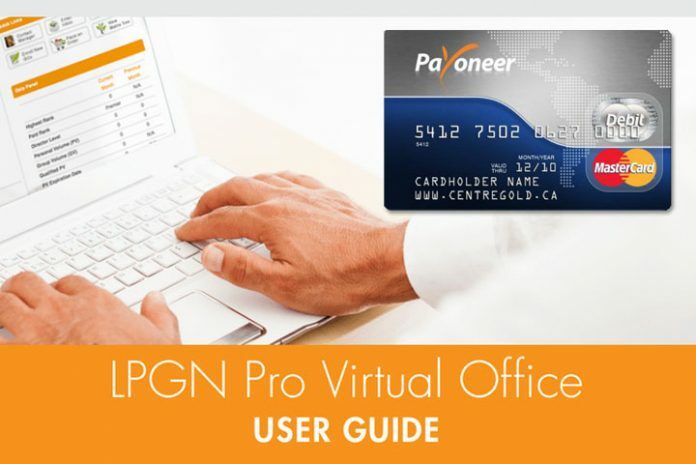 LPGN Pay Card will be available soon. The date range is 45 days which you can adjust to a later date. 1. Sign-up for Payoneer. Once you earn at least $50 USD in commissions, a link to sign up for Payoneer will be available on the eWallet page of your Virtual Office. You can then choose to sign up for the Pay Card or the Global Bank Transfer. 3. Get your money through Payoneer. Payoneer is a global payments company that offers a safe, efficient and convenient method for individuals around the world to get paid. Payoneer Pay Card is a prepaid card that works just like any other debit card, and can be used to make purchases online, in stores, and at ATMs worldwide where Mastercard®/Visa is accepted. You can use the Pay Card to receive the commissions you earn with LifePharm Global Network. If you are an American Citizen, you need to submit W-9 form to LifePharm Global Network. Once cleared, you can make arrangement to withdraw the money to an accredited bank. For other countries, you need to submit W8-BEN form, preferably with your own Tax number to avoid being taxed in the USA and in your own country. Laminine products are made in the USA and are subject to their own tax system. When the product is exported to the Philippines, our own tax system is applied. Effective February 15, 2014, tax from your EWallet is automatically deducted and you do not need to submit anything. If you wish to use your purchase tax deductible, please submit your TIN to your local Laminine Master Distributor in your country. To avoid being taxed by the IRS (USA) when you withdraw your EWallet, please download and submit your W8-BEN forms to DanyelleS@lifepharmglobal.com of LifePharm Global Network, the mother company. 1. For non-US citizen. This includes IBOs from the Philippines or any IBO account using a Philippine address. 2. A person not claiming income that is connected with any US business or trade. 1. For US citizen or Foreigners with dual citizenship. 2. This includes IBOs using a US address. 3. The person claiming income that is connected with any US business or trade. LPGN, the parent company does not directly sell the product, you need to order it through a distributor’s website (like AltheaDistributor.com) You can call Diana Dimaano at 7737630709, Chicago based direct seller.